Large two-bedroom duplex cottage with front living room. Includes pullout sofa bed for a single person in the front room plus a king-sized bed in the first bedroom, then a queen bed in the second bedroom. Single bath with historic claw-foot cast-iron tub with shower. Includes flat screen TV., granite-top galley contemporary kitchen complete with dishwasher, microwave, and two-burner ceramic glass cooktop. One block to central main street, however we are on a quiet side street. One block from downtown Calistoga on a quiet street. difficult to find, address wrong on vrbo and actual location. owner super helpful, walking travel guide. very comfortable and everything worked fine. would not hesitate to stay here again. A very nice review from really nice folks. Hope they do come back. There's lots more to see. Easy to check in, super comfortable beds with great linens, lots of fun character! Only complaint is the clawfoot tub is only really set up for showering. We so enjoyed our time at the cottage. The accommodations were very nice. Adele was a great hostess. If we needed anything, Adele took care of it right away. I'm sure we'll be back! We had a great stay! We didn't get in until late due to flight issues and Adele waited up for us to help us get in. We could walk into town every morning for coffee and we were close driving to all of the stops! Had a great time! Cute and charming cottage in a lovely, quiet side street. Very old, chunky pieces of furniture and dusty dried flower arrangements made up the furnishings. Showers proved a little difficult as there was nowhere to place your shampoos etc. and getting in and out of the tub was tough, especially for the over 60 crowd. Adele was most helpful and responded to our requests promptly. Sorry our guests did not like some of our beautiful antique chairs and tables. The look nowadays is more to Ikea and modern, however our photographs do show the furniture. I'd love to have real flowers every day, but silk flowers will have to do for now. The maid forgot to put the shower hanger back, sorry about that, but the tub is actually regulation size, and you have to step up to get out of the tub. Can't fix that one. Hope they had fun here, as it's a great little town. 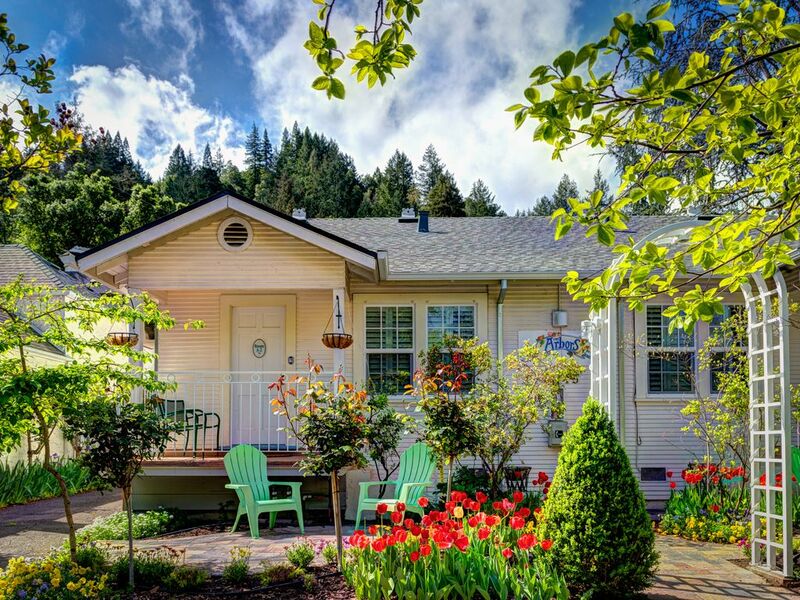 Walkable to downtown Calistoga, in a lovely garden setting. Hundreds of wineries within close driving distance.